The Volvo S60 Dynamic is designed for the comfort of the driver and passengers. The vehicle is equipped with a power moonroof. You can let the light shine in and feel the breeze on a warm summer's day. The Volvo S60 Dynamic is also equipped with curve traction control. This is a system that improves the way that the vehicle holds its line around a corner. It provides superior steering and handling. The Volvo S60 Dynamic is waiting for you to take it for a test drive at Bill Kidd's Volvo Cars. 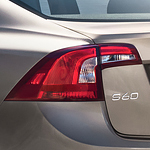 Come check out what the Volvo S60 Dynamic has to offer.